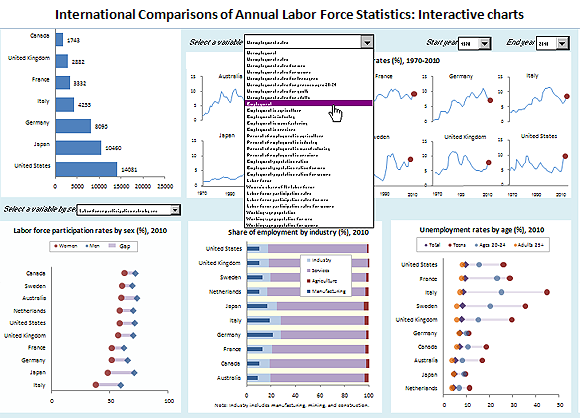 The Bureau of Labor Statistics International Labor Comparisons Program (ILC) has recently unveiled a series of new interactive dashboards for comparing international economic data. The visual analytics tool will allow users to create a number of charts and graphs for interpreting a wide range of economic indicators. The ILC dashboards provide interactive charts and graphs created through Excel. Each interactive dashboard covers a different economic dataset. Users can instantly compare and analyze data trends based on their selected inputs simply by choosing the indicators, countries, and the years – and the corresponding visual data appears instantly.